A user-friendly, waxless touring ski, Rossignol's EVO TRAIL 65 POSITRACK is designed for recreational skiers and active winter enthusiasts. Smaller, more accessible sizes allow increased maneuverability and control while waxless Positrack bases provide the best blend of grip and glide in all snow conditions. 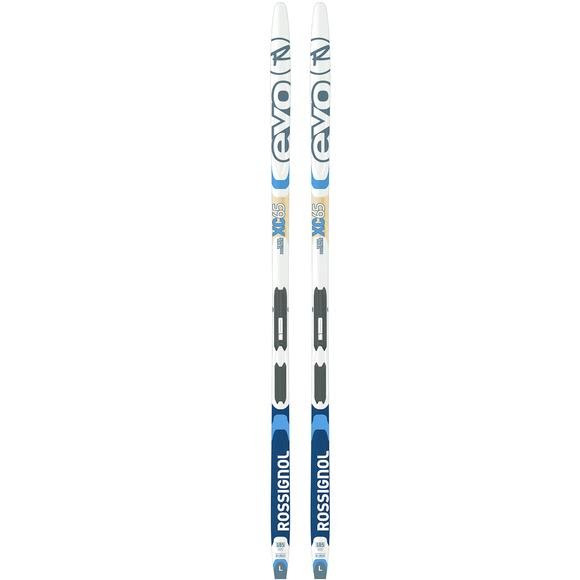 A user-friendly, waxless touring ski, Rossignol &apos;s EVO TRAIL 65 POSITRACK is designed for recreational skiers and active winter enthusiasts. Smaller, more accessible sizes allow increased maneuverability and control while waxless Positrack bases provide the best blend of grip and glide in all snow conditions. Compatible with the new Turnamic® binding system for the most natural ski flex and snow feel. WOOD AIR CORE construction offers durable off-trail performance with air channels for reduced weight. Waxless POSITRACK base structure features finished base with positive thermoformed kick surface for the best blend of grip and glide in all snow conditions. Exclusive SHORT SIZE concept guarantees increased maneuverability, control, and ease-of-use while making skating movements more dynamic.